What Is the HDL Risk Factor? Is 144 Cholesterol Too Low? What Are the Normal Levels of LDL & HDL? If you're over the age of 40, most health care professionals recommend that you get an annual physical examination that includes a "blood lipid profile" to determine your risk for heart disease. Lipid profiles typically include measurements for total cholesterol, low density lipoprotein (LDL), high density lipoproteins (HDL) and triglycerides. The four tests interpreted together will help determine your relative risk for heart disease. Cholesterol is a fatty or "waxy-like" substance that circulates through the bloodstream. And, while cholesterol has many important functions like cell maintenance and hormone production, too much of it can contribute to heart disease. Total cholesterol is composed of several types of cholesterol and the number by itself is not as important as its individual components. The American Heart Association recommends total cholesterol levels below 200 mg/dl. Other organizations recommend even lower levels---below 185 mg/dl. Cholesterol levels between 200 and 239 mg/dl put you at a borderline risk for heart disease. Levels higher than 240 mg/dl put you at a high risk for heart disease. Low density lipoproteins (also called LDL) are often referred to as the "bad" type of cholesterol. LDL cholesterol circulates in the blood stream and accumulates on the inside of the arterial walls, where it calcifies as plaque and causes atherosclerosis, or narrowing of the arteries. When the internal diameter of the arterial walls narrows or become occluded, the blood flow to the heart can cause a heart attack. The same thing occurring in the arteries that supply blood to the brain can cause a stroke. The American Heart Association categorizes your risk for heart disease based on the following LDL levels. Less than 100 mg/dL is considered optimal and up to 129 mg/dL is near optimal. Borderline high LDL ranges from 130 to 159 mg/dL and 160 to 189 mg/dL is considered high. Above that level is categorized as very high. High density lipoproteins (HDL) are categorized as the good type of cholesterol. HDL is thought to offer some protective value against heart disease and can be raised by regular aerobic exercise, smoking cessation and certain dietary sources. HDL levels below 40 mg/dl for men and 50 mg/dl for women are thought to put you at a greater than average risk for heart disease. Individuals who regularly exercise can achieve HDL values over 60, lowering their relative risk for coronary artery disease. Another form of blood fat are "triglycerides," and while they do not represent a specific indicator for contracting heart disease, they are often associated with other risk factors like HDL and LDL cholesterol. 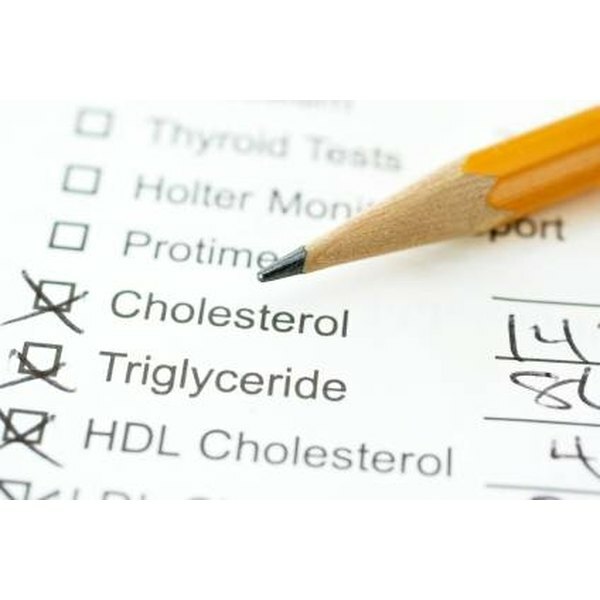 Typically, people with high levels of triglycerides also have high total cholesterol, high LDL and low HDL. Typical triglyceride levels are associated with the following risk for heart disease. Less than 150 mg/dL is considered normal, while 200 to 499 mg/dL is considered high. In between the ranges is considered borderline. Can Wine Affect Your Cholesterol? Does Fiber Lower Cholesterol & Triglycerides?